Economist Hema Senanayake, in a recent article, had argued cogently that the South Asian Institute of Technology and Medicine or SAITM was not a private medical school, but a private monopoly (available at: https://www.colombotelegraph.com/index.php/saitm-is-not-a-private-medical-college-but-a-private-monopoly/). His opinion has certainly opened a pathway for anyone to analyse the issue at hand from a hard economics point. However, when delved into it deeply, one could discern two interesting revelations. One is that SAITM goes beyond a monopoly. It is a classic example for a natural monopoly in the making. The other is that all those who are involved in the SAITM issue are also either monopolies (a single supplier) or oligopolies (few suppliers who work together) or monopsonies (a single buyer). Hence, the war declared against SAITM is a war between two groups of monopolies which have declared that they would fight it to a finish. What is a natural monopoly? It is a firm that experiences a continuously falling average cost structure and, therefore, could emerge as a monopoly by effectively competing out all other firms in the industry. Such an industry is characterised by two features. One is that a firm entering the industry will have to incur a very high initial capital outlay to begin its operations. Thus, the door is closed to all those who do not have that magnitude of capital. The other is that once that capital expenditure has been incurred, its average cost of producing an additional unit of output begins to fall over a significant range of output. As a result, that firm faces a continuously falling average cost curve. The implication is that within its existing capital investment, it will continue to produce since it is still profitable for it to produce more. Thus, it would end up capturing the entire market. In contrast, a typical firm faces a ‘U’-shaped average cost curve where the average cost would fall at the beginning, bottom out at a certain output and then starts to rise. Such firms have to stop producing when they find it unprofitable to produce any more. Hence, none of the firms produce the entire output demanded in the market compelling them to share the market with others. These features of a natural monopoly are present in medical schools. They have to incur a high initial capital outlay to set up a teaching hospital, a must that allows medical students to apply their textbook knowledge to living patients. In addition, a teaching hospital has to incur two other types of costs as well. One is the annual maintenance costs of the teaching hospital. The other is the periodical upgrading costs. Without them, a teaching hospital cannot offer its services to medical students. This was eloquently presented by Sri Jayewardenepura University’s former Vice Chancellor and presently Senior Professor at the Medical College affiliated to Kotelawala Defence University or KDUMC – Narada Warnasuriya – in a live television discussion recently (available at: https://www.youtube.com/watch?v=1qpA9aWua6Q ). Warnasuriya admitted that he was a member of the Sri Lanka Medical Council or SLMC, obviously a role that conflicts with his position at KDUMC. He maintained that without a proper teaching hospital, a private medical college cannot assure the required teaching standards. Hence, according to him, it is unlikely that a private investor could have such a hospital acceptable to regulators in view of the high costs involved. He strongly objected to private medical colleges on that ground and favoured State-sponsored medical colleges for which the teaching hospitals would be run by the State at taxpayers’ expense. If Warnasuriya’s view is shared by other members of SLMC, it is unlikely that a private medical college sans an acceptable teaching hospital would be approved by this regulatory body. Thus, new entry to private medical teaching field has been restricted by high capital requirements. As such, it is a bonus to any existing private medical college since it is well protected from prospective newcomers restrained by high capital requirements. In this sense, KDUMC is already a natural monopoly. SAITM is a potential candidate since it has already invested in a costly teaching hospital. If SAITM is approved by SLMC, then, Sri Lanka’s private medical education field would be shared by two natural monopolies, SAITM and KDUMC. Who are the other monopolies involved in the present war? The Government Medical Officers’ Association or GMOA which claims to be the only trade union of the State sector medical professionals is one such monopoly. Hence, it is in a position to dictate terms to both its members and its employer, the general public. Anyone who crosses its path is to have a bitter experience as the events in the past have proved. If it decides to keep its members away from work for whatever the reason, the general public has to accept the justification it provides for its action. Another monopoly in the war is the Inter-University Student Federation or IUSF, a loosely connected students’ body that does not have official recognition. But, it is more powerful than any of the officially sanctioned student bodies in Sri Lanka’s universities. They have arrogated that power to themselves by being daring fighters in the streets as well as within-the-university system. There is no any other student body which can challenge it for supremacy, since they cannot match its capacity to unleash violence against opponents. Thus, if IUSF chooses a certain path, everyone else, including university administrations, have no choice but to tread on it. If they refuse, their life becomes miserable. It is a state of fear that has crippled the country’s university system. This state of fear has been amply vocalised by Sri Jayewardenepura University’s Professor Sunethra Weerakoon in an article titled ‘Institutional and cultural corruption within public universities: an urgent policy challenge for the government’, published in the proceedings of a conference on the Present Status and Way Forward for Public Universities in Sri Lanka held at the auspices of the University of Sri Jayewardenepura in 2016. According to her, when asked why students who had not attended even a single class should be permitted to sit for examinations, the Dean, Faculty of Social Sciences and Humanities had responded that if they were not permitted, they would not allow others to sit for exams. IUSF, a monopoly, is in the forefront of this sad state of affairs at universities. What about the 8 Medical Faculties affiliated to State universities in Sri Lanka? They are an oligopoly working in collusion with each other. In any field, including education, the secret for excellence is competition and if competition is absent, there is no incentive for anyone to work toward it. Since the Deans of the eight Medical Faculties are ex-officio members of SLMC, they have incentive to protect their own interest when it comes to competition from non-State sector medical schools. A better arrangement would have been for SLMC to consult them if it is deemed desirable rather than allowing them to sit on the board with voting powers. The Health Ministry, being the largest single employer of medical professionals is a monopsonist or a single buyer. Hence, the recruitment or otherwise of those passing out from State medical faculties hangs on the discretionary choice of the Ministry. When the Ministry is faced with budgetary constraints, its ability to recruit all the medical professionals passing out from State-owned medical faculties is also restrained. In such a situation when foreign graduates or those who may pass out from private medical colleges too enter the market, the chance of the locally qualified medical professionals to get employed as a right is greatly reduced. Hence, the students entering medical faculties, IUSF which organises them into protesting bodies and GMOA which is mainly made up of locally qualified medical professionals at the entry level have all the incentives to get together and form themselves into a powerful single monopoly. Now the two monopoly groups involved in the SAITM issue have vowed to battle it out to a finish leaving many casualties behind. The casualty rate in the SAITM has been enormous. Medical students in State medical faculties have abstained themselves from attending classes since January 2017. But, the State has continued to pay salaries to lecturers which payment is a deadweight loss. IUSF, supported by GMOA, has brought all students to the street making them cannon-fodder when the State chooses to maintain law and order. When these street marches take place, cities involved will come to a halt, agonising the citizens. 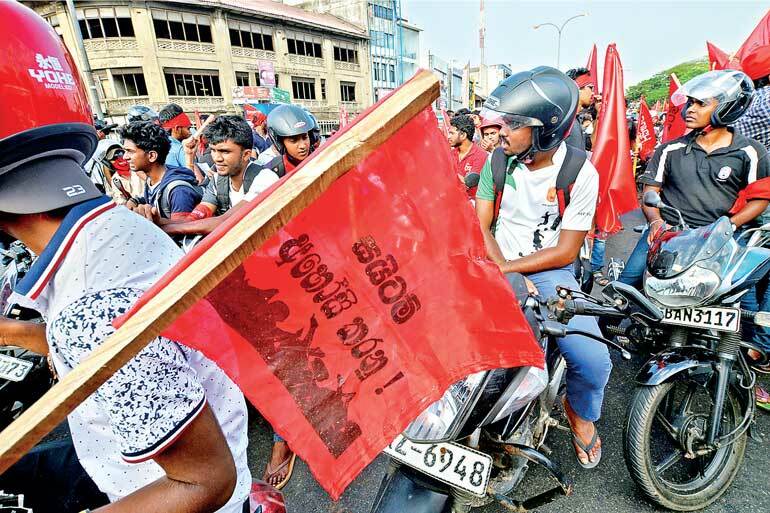 GMOA has been in the practice of announcing wildcat strikes demanding the closure of SAITM, crippling the country’s State-sponsored medicare system. The burden of such strikes has squarely fallen on the low income groups since they cannot afford to patronise private healthcare institutions that continue to function. Thus, GMOA has unwittingly created a poor state of healthcare services in country. An angry senior physician, Dr. Sarath Gamini de Silva, in an open letter to the President, GMOA, had labelled it as a crime against society (available at: https://www.colombotelegraph.com/index.php/an-open-letter-to-gmoa-president-padeniya/). The disruption to medical education, perpetrated by IUSF and GMOA in the guise of fighting for the rights of the poor, has in fact caused them to languish in State-run medical faculties. The well-to-do, on the other hand, have not been affected by such disruptions. They have been sending their children to foreign countries for medical education and after their return have been able to grab the limited number of places in government hospitals. The very principle of equity which both IUSF and GMOA have been advocating has thus been grossly violated. As such, the monopoly power enjoyed by these groups has been to the detriment of the future prosperity of the country. Broadly, the war against SAITM is a war against private medical education within Sri Lanka. There is no objection by those who have declared this war, namely, GMOA and IUSF, for Sri Lankan students to receive this education from a foreign country. The present cost of such education, even in a country like China, is in the region of about Rs. 30 to Rs. 40 million. Obviously, such a magnitude of expenditure could be incurred for private medical education only by the very rich. The local production of such a medical graduate, as the fee structure of SAITM has revealed, does not cost more than Rs. 12 million at present. Hence, it is a sizable cost reduction for local middle classes who desire to have their children educated in medicine. The argument against private medical schools by IUSF, as presented by one of its representatives at a recent television debate has been that poor children cannot afford to bear such a high cost (available at: https://www.youtube.com/watch?v=lAgL2M8tS7Q). This problem could be sorted by accommodating some students on merit to private medical colleges either on scholarship or under a bank loan scheme. Private universities love to accommodate merit students on scholarship to create a competitive atmosphere within the system. The admission of such merit students will allow private universities to facilitate cross-fertilisation of students. But that would increase the supply of medical graduates. However, some academia in the State medical faculties and those in GMOA appear to be maintaining that Sri Lanka does not need any more doctors (watch: https://www.youtube.com/watch?v=1qpA9aWua6Q). At present, the country’s healthcare system provided both by the State sector and the private sector has been overstretched due to the shortage of physicians. This is manifested by increased waiting time and long queues at these healthcare institutions. Hence, this argument appears to have been made in order to protect the monopoly rights rather than in consideration of the country’s actual requirements. Both IUSF and GMOA have argued that education is a right and not commodity traded in the market. The rationale behind this argument is that even those who are unable to pay for education out of their funds should have facilities to receive education. In the case of State-produced education where fees are not charged, the community pools their resources and meets the expenditure. Hence, it is a loan advanced by the community to students in the expectation that they would repay that loan once they acquire skills by being gainfully employed. Thus, students receiving public education in Sri Lanka are debtors of the community. On the other hand, those in private universities pay for their education out of their own funds. Through that education, they acquire skills and provide a service to the community later. Hence, they have given a loan to the community by undertaking education at their own cost. Thus, they become creditors of the community. Now the issue is how this debtor-creditor relationship could be properly accounted for by community. A way to do this was suggested by Professor Rohan Samarajiva at a television debate recently (watch: https://www.youtube.com/watch?v=1qpA9aWua6Q). He suggested that a hypothetical account should be opened by the State in the name each student. The students at State universities have borrowed money from the community and spent on their medical education. Hence, they are debtors to the taxpayers and their account with the State should be debited by the amount they have so borrowed. The direct cost involved in the salaries of the lecturers and technical staff at medical faculties, has been estimated at about Rs. 5 million per student. But when the full cost is reckoned by incorporating the cost of buildings, equipment and maintenance at universities plus the apportioning of the costs relevant to teaching of students at Government hospitals, it is a colossal sum. This is the amount to be debited to their account. However, the students at private medical colleges have loaned the community by spending their own funds for acquiring skills. Hence, they are creditors of the community and the amount they have spent should be credited to the account which the State maintains in their name. Samarajiva says that those graduates passing out of State universities should pay back to the community by serving an agreed period within the country. The repayment could be accelerated if they serve in what is considered as difficult regions. In the case of private medical graduates, the community has to repay the amount by allowing them to serve hospitals run by the government or the private sector. Once the repayment period is over, graduates in either stream could offer their services to an employer, in Sri Lanka or outside, according to their choice. Though Samarajiva made a very important suggestion, it did not receive the attention it deserves from others who participated in the television debate. Instead, they got themselves engaged in hurling abuses at each other. That is the sorry state of intellectual discussions in Sri Lanka.